Eat freely. Milk free. Nut free. Soy free. No artificial anything! Certified gluten-free. Non GMO Project verified. nongmoproject.org. Free of the 8 common allergens. Gluten free. For unique recipes, visit us on Pinterest. Allergy Friendly: Our products are free of: wheat; dairy; peanuts; tree nuts; egg; soy; fish; shellfish. Also made without casein, potato, sesame and sulfites. Made in a dedicated nut and gluten-free facility. No artificial anything! At Enjoy Life, our whole business is making smile-good foods that keep people's insides happy. That's why all of our foods are specially made to be gluten-free and free from the 8 most common allergens. - Scott Mandell and the Enjoy Life team. We support organizations that help people with special dietary needs. pinterest.com/enjoylifefoods. facebook.com/enjoylifefoods. 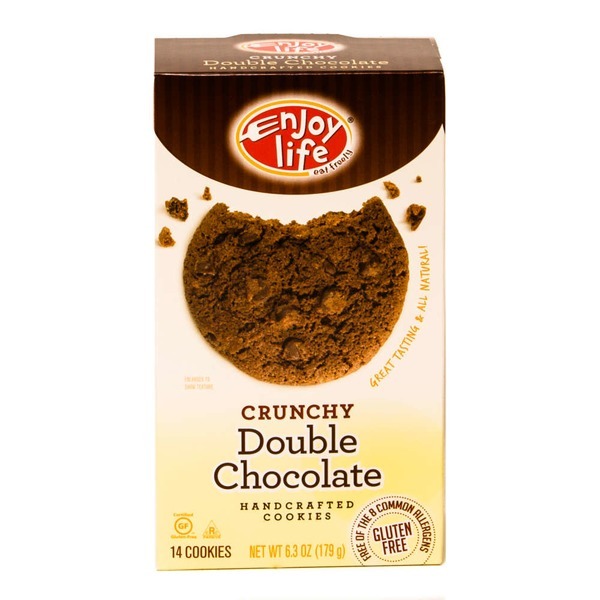 twitter.com/enjoylifefoods. www.enjoylifefoods.com. This carton is 100% recyclable. Product of the USA. Flour Mix (Rice, Buckwheat, Millet), Chocolate Chips (Cane Sugar, Unsweetened Chocolate, Cocoa Butter), Palm Oil, Brown Cane Sugar, Dried Cane Syrup, Cocoa Powder, Natural Flavors, Vanilla Extract, Salt, Leavening (Cream of Tartar, Baking Soda), Xanthan Gum, Konjac, Rosemary Extract.